A tree-planting project for a special purpose such as energy conservation, or requiring special circumstances such as pit construction or vandalism protection was successfully implemented. Such a project would require a special appropriation, or special cooperation with the neighborhood or business district. The maintenance of publicly owned utility lines was significantly improved to reduce adverse impacts on trees. An example would be training in the use of state-of-the-art techniques that avoid topping trees, or qualifying as a Tree Line USA Utility. A biomass recycling program was successfully implemented or significantly improved. This may include street tree leaves, lawn wastes, tree removals, Christmas trees, etc. 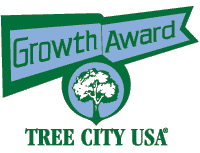 The city formally established or significantly improved its street-tree-planting program. A formal pruning system was established or improved for the city's street trees. This criterion requires significant improvement through the initiation of regularly scheduled visits to all street trees depending on the requirements of the species, or the reduction of time between visits if needed. A hazard tree assessment and action program was established or significantly improved, including employee training and a systematic method that includes periodic tree inspections and prompt follow-up when needed. A program such as an educational or ordinance enforcement campaign to eliminate tree topping community-wide, or a training program that eliminates tree damage caused by employees misusing herbicides, weed cutters, and lawnmowers was successfully implemented. Systems and methods for insect and disease control that are environmentally sensitive were put into place or significantly improved. Plans were developed or significantly improved for projects such as vest-pocket parks, arboretum improvements, memorial tree groves, woodland acquisitions, etc. to be available in case of unexpected cash donations or similar opportunities. A contract with a nursery was initiated or significantly improved to provide specific varieties or species of street and park trees for future years (to enable planning and to assure having the right trees for the right sites). 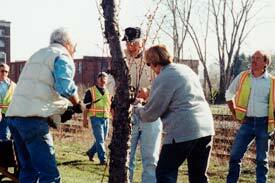 A special project or program was initiated to preserve or relocate trees on development or construction sites.